Is there such a thing as a comfort cookie? Maybe. The problem is, I love cookies, so many kinds of cookies, that when I try to pick a favorite, I can't. When I try to pick a 'most comforting' cookie, I can't. 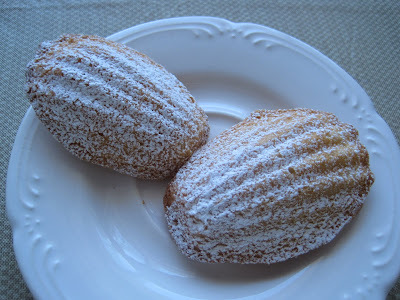 But high on my list for both those categories (favorite and comforting): madeleines. Madeleines originated in the Lorraine region of France. They are sponge cakes in the shape of a shell. The batter is a genoise batter. 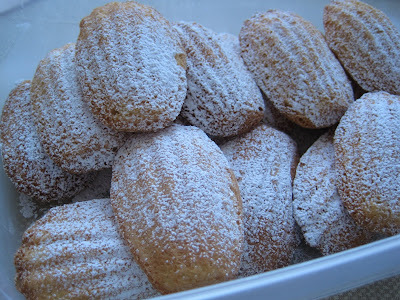 Madeleines are 'famous' because they are mentioned in a Proust novel. I've never read Proust. Rather, my love is simply from seeing a recipe in Bon Appetit for Earl Grey Madeleines - the shell shaped cookies looked so lovely and cute. Plus, Earl Grey tea flavor - yum. I cut out the recipe and saved it for years, thinking that surely someday I'd get madeleine pans and make them. 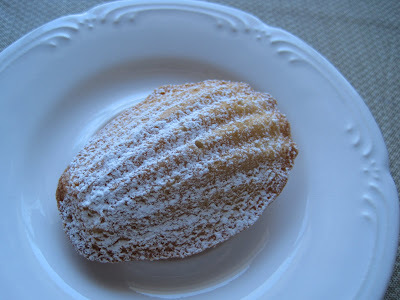 Years later, SP gave me madeleine pans as a birthday present and we began our journey to master madeleines. They are so good. We've made regular, chocolate, lemon-almond, and gluten free madeleines. My favorite is the regular. I find the chocolate were too dry and not chocolate-y enough, the lemon-almond too sticky, and the gluten free, well, I like my gluten. Saturday afternoon SP made me madeleines. We hadn't made them since last June or July (!) and I adore these little cookie/cakes. Definitely a comforting treat. Plus, lemon flavored - and lemon is one of my favorite flavors!